We have put four puzzles up for auction on eBay! Please note that the puzzles we have put up for the auctions are prototype or 2nd grade. Compared with the products we are selling at our shop, material, spraying, finishing and precision look to be at a disadvantage. When you bid, please make sure of the quality by looking at the pictures on eBay. 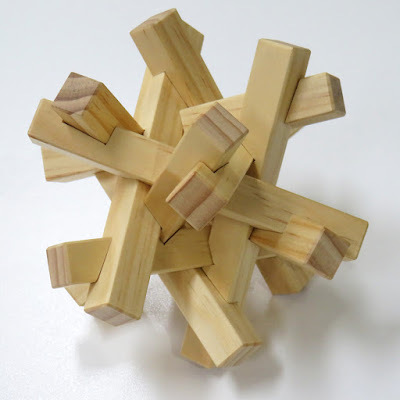 This puzzle is assembled with 30 pieces all of different shapes for becoming the form of compound of five tetrahedra. 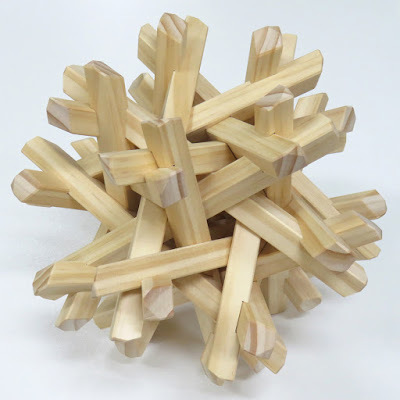 This puzzle is made of pinewood and is non-coated. We are going to sell this puzzle's product version that was made with five different colours of hardwood soon. They look much more gorgeous than the prototype. Please look forward to them! This prototype puzzle is thin-coated and made with pinewood. 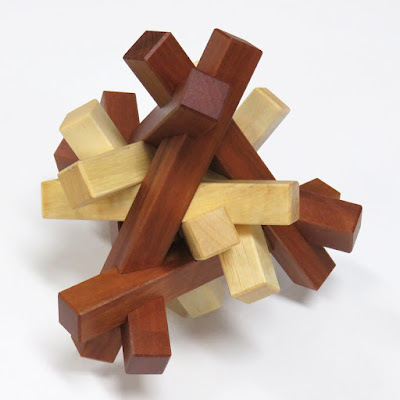 The regular product of this puzzle is made with three different hardwood and is selling at A$132.00. Maybe this puzzle is suitable to be described as a 2nd-grade puzzle rather than a prototype. Juno cut the puzzle pieces from the end of the long stocks of timber. Therefore, there are subtle snipe marks on some pieces caused by the thicknesser and also there are a few hairline cracks on them. There are 16 possibilities for the pieces of Pisa #2. When Juno designed Pisa #2 + Cubin Burr, he chose the eight pieces which are one of the most elegant selection and can be a unique solution. 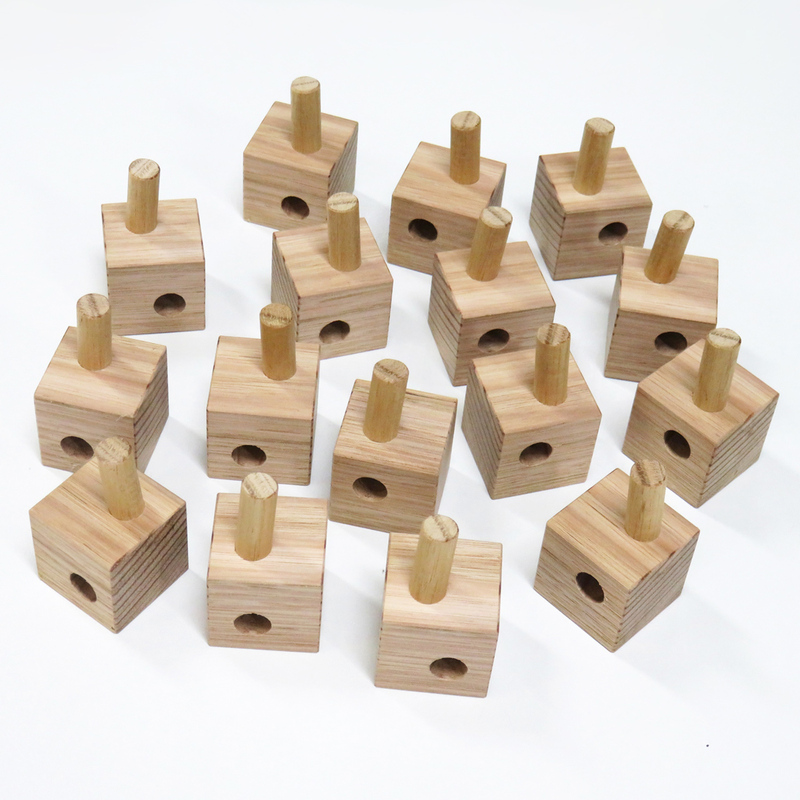 The prototype that is up for the auction is a 16-piece complete-set type that contained the pieces that can be assembled for two unique solutions of cubes. Well, Juno's birthday is coming soon. We are going to donate half of the sold amount of this auction to The Animal Welfare League Queensland. Maybe another half, Juno wants to eat delicious sushi for his birthday. So, we are looking forward to you joining our auction!